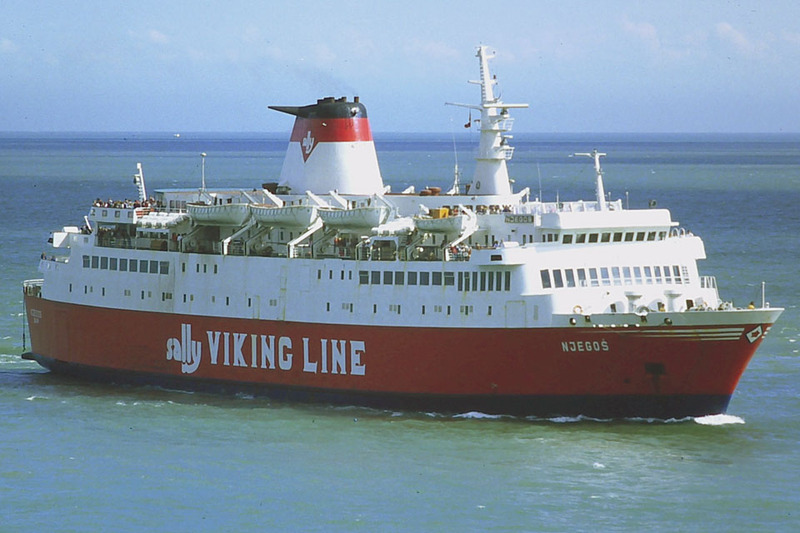 Steel twin screw motor vessel built by Schichau Unterweser AG, Bremerhaven in 1971 (Yard No 478) for Moltzau Line A/S, Gedser, Denmark, as a passenger, car and commercial vehicle roll-on roll-off ferry. Registry: Gedser, Bar (Yugoslavia), Aberdeen, Saudi Arabia. November 17th 1970: Keel struck. May 18th 1971: Sea trials. May 19th 1971: Delivered to Moltzau Line A/S, Gedser, Denmark. 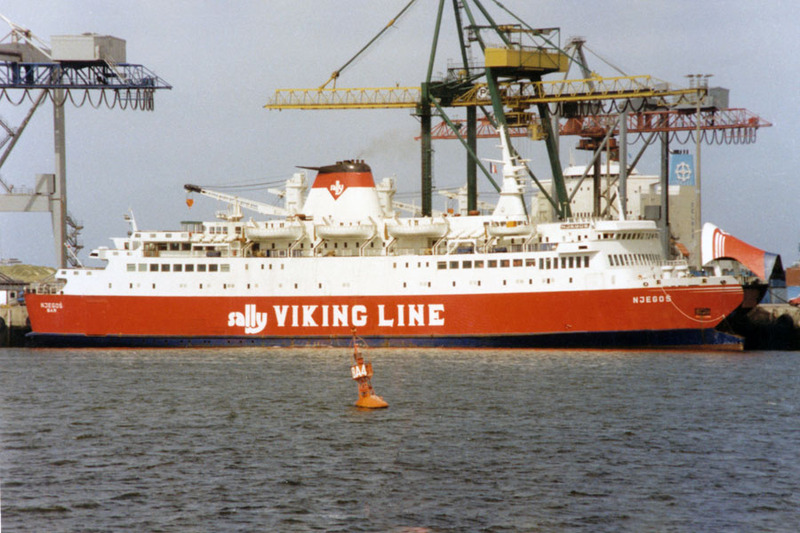 May 20th 1971: On the journey from the builders to Travemünde, she suffered major electrical problems and had to be repaired at Werft Nobiskrug, Rendsburg. May 23rd 1971: Arrived at Travemünde. 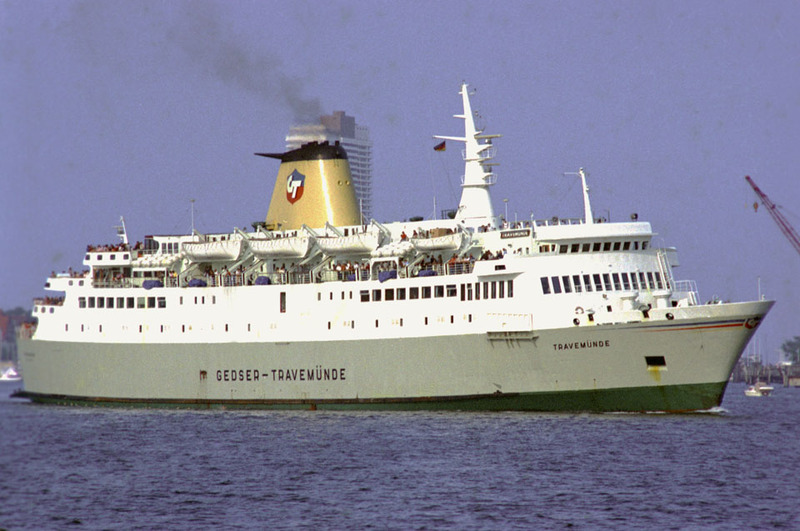 May 25th 1971: Commenced service between Gedser – Travemünde. 1976: Registered to Gedser – Travemunde Ruteen A/S, Gedser. December 31st 1980: Sold to Prekookanska Plovidba, Bar, Yuoslavia. Renamed NJEGOS. 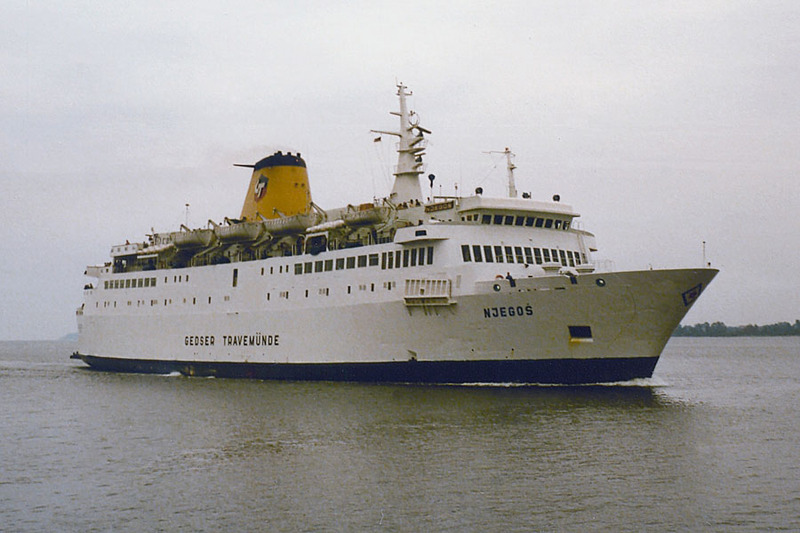 January 1st 1981 – June 18th 1981: Bare-boat chartered to Gedser-Travemünde Ruten A/S, Gedser for further service between Gedser – Travemunde. 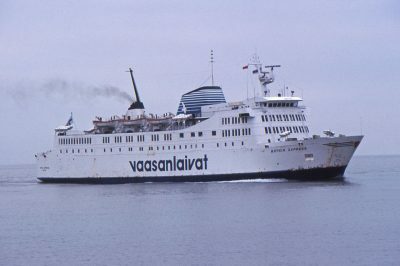 June 19th 1981: Final arrival in Travemunde. June 24th 1981: Journey to the Mediterranean. July 1981: In service between Bar – Bari. 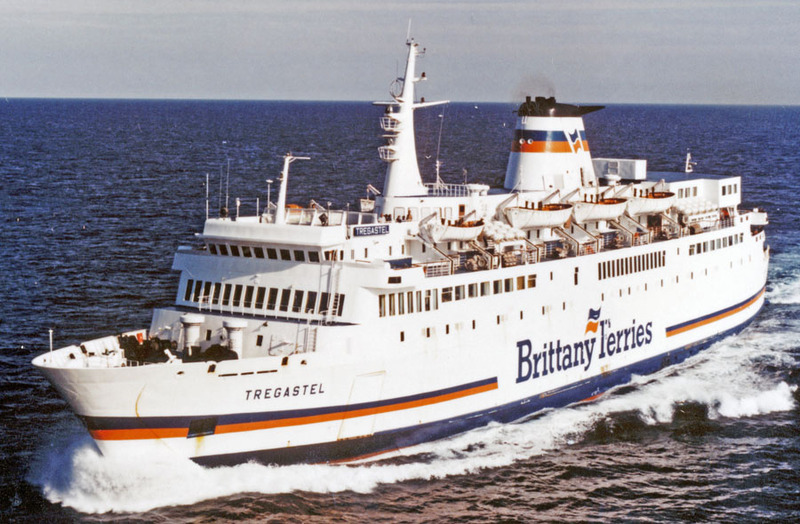 May 1994 – July 1984: Chartered to Brittany Ferries SA, Roscoff, France. 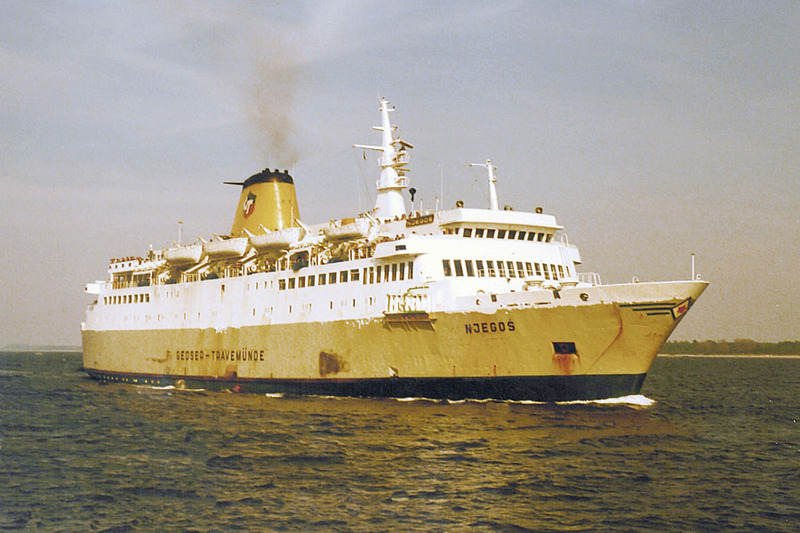 In service between Roscoff – St Malo – Portsmouth. July 3rd 1984 – October 6th 1984: Chartered to Sally Line. 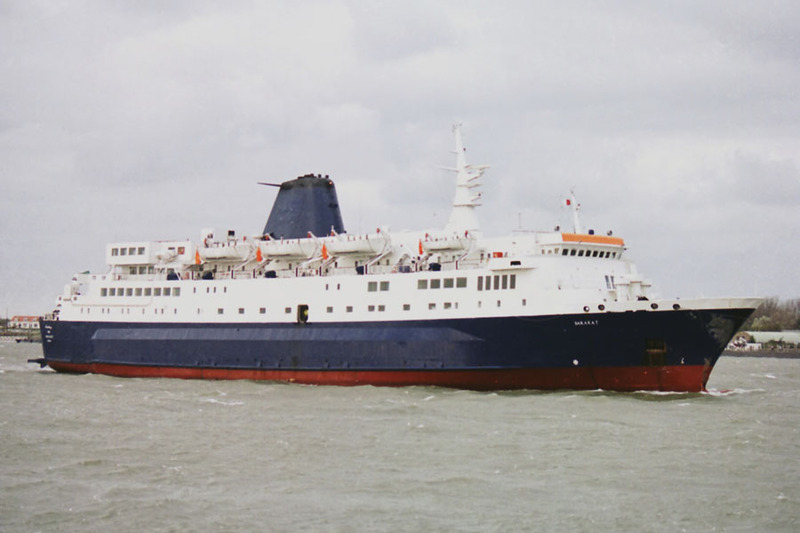 In service between Ramsgate – Dunkerque. October 6th 1984: Laid up in Dunkerque. 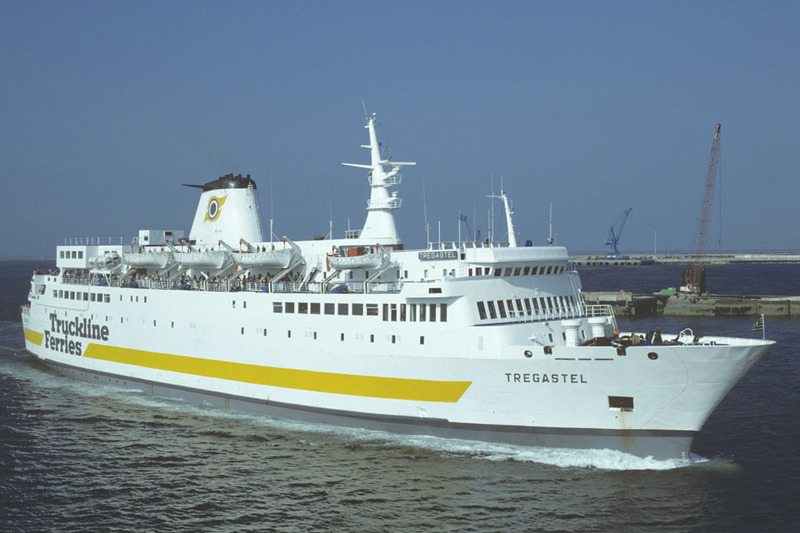 1985: Chartered to Brittany Ferries SA, Roscoff, France for three years. 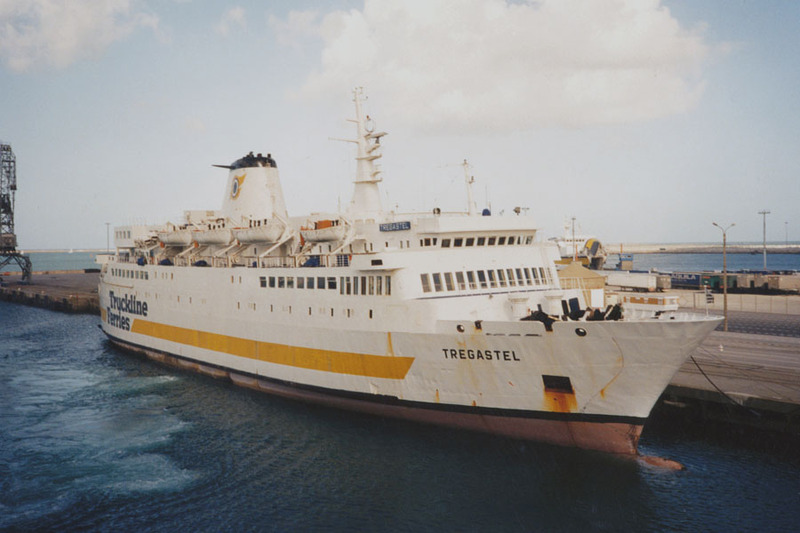 Renamed TREGASTEL. 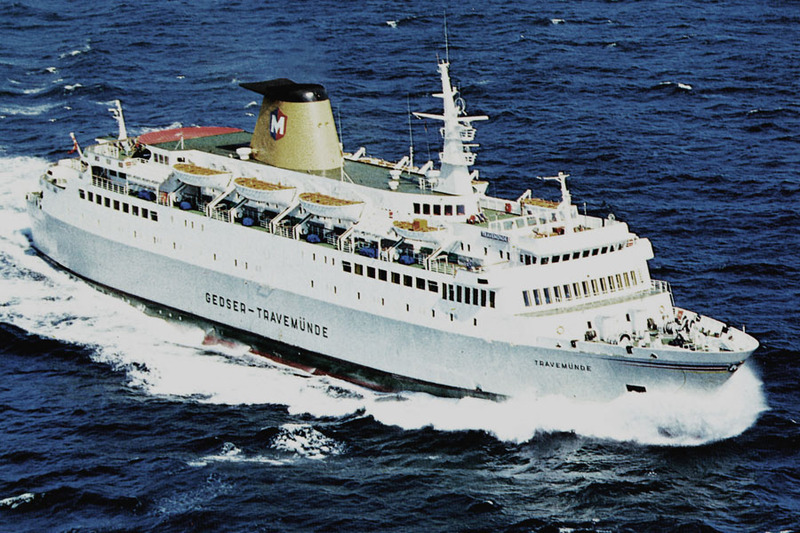 May 1st 1985: Commenced service between Plymouth – Roscoff. 1987: Sold to Finouest (B.A.I.S.A.) 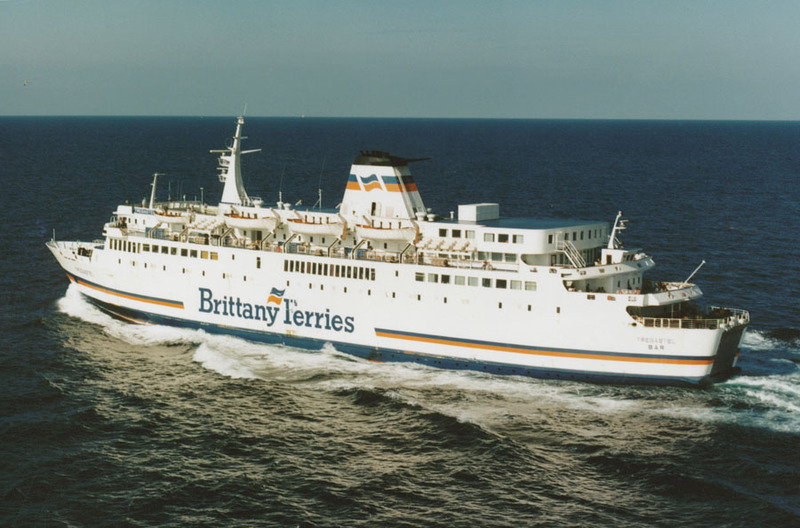 Brittany Ferries (Bretagne-England-Ireland), Roscoff, France (Brittany Ferries). 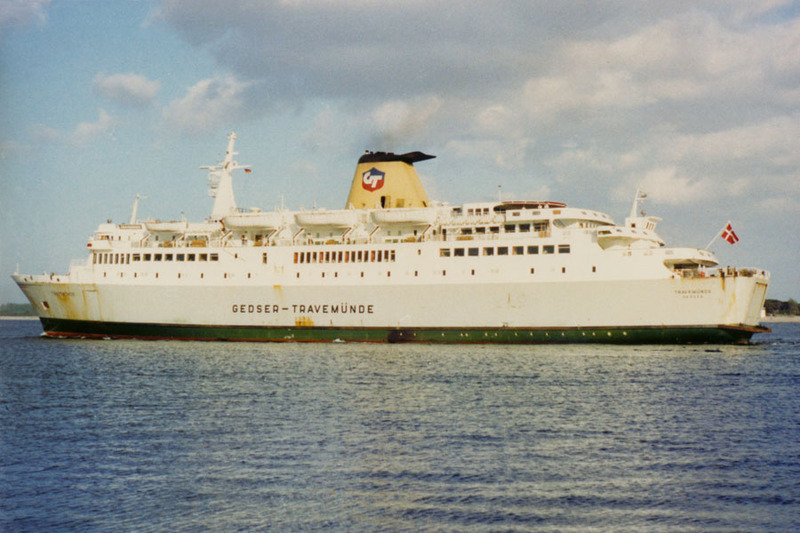 Rebuilt at HDW, Kiel, Germany, then Roscoff – Plymouth service. 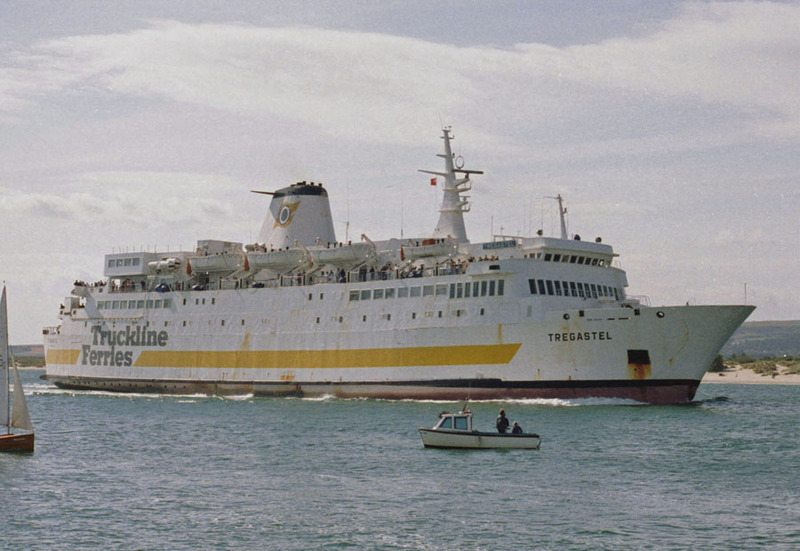 July 18th 1989: Transferred to Truckline Ferries for service between Poole – Cherbourg. 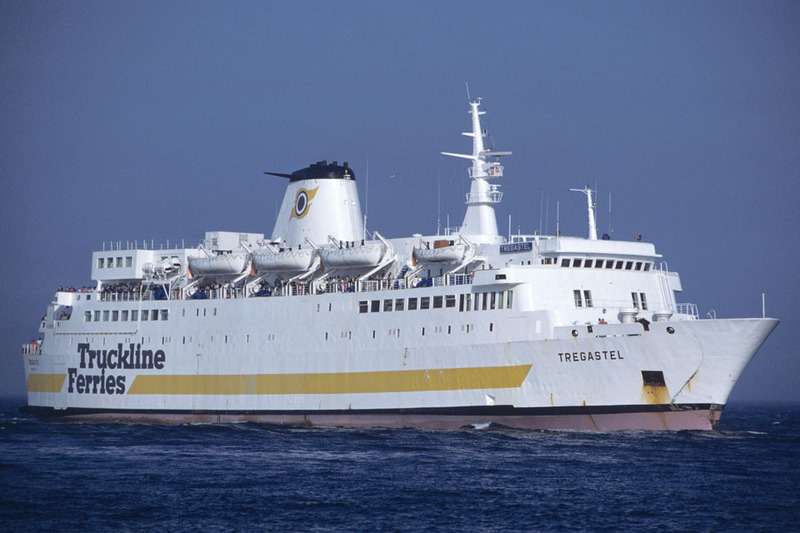 July 7th 1990 – September 30th 1990: Cherbourg – Poole. October 1990: Chartered by the French Government as a troop transport to the Persian Gulf. 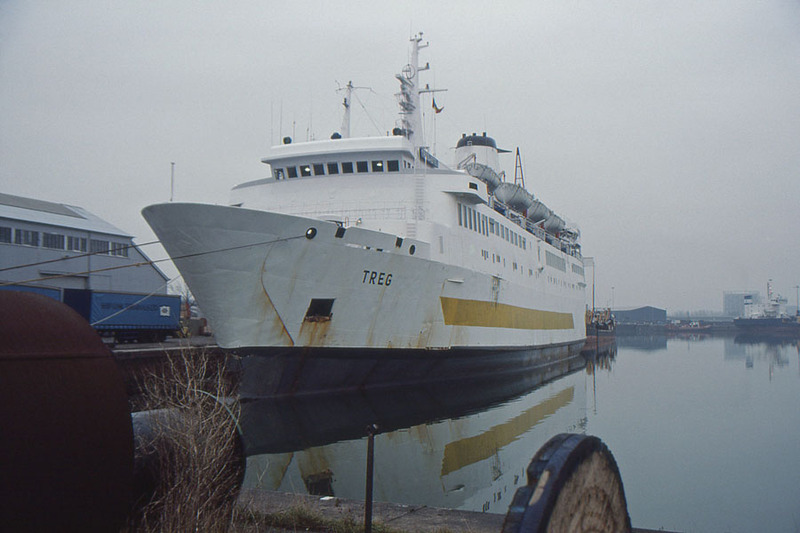 September 29th 1991: Last service between Poole – Cherbourg. 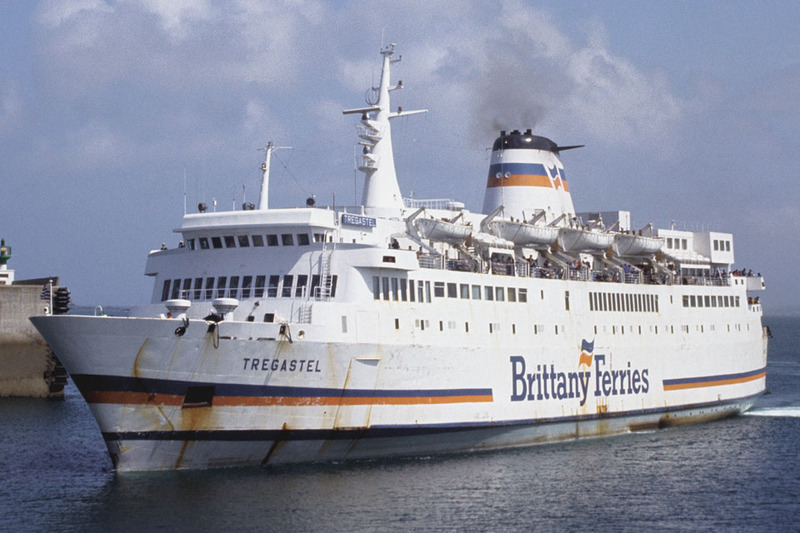 October 7th 1991 – October 17th 1991: Services between Roscoff – Plymouth. 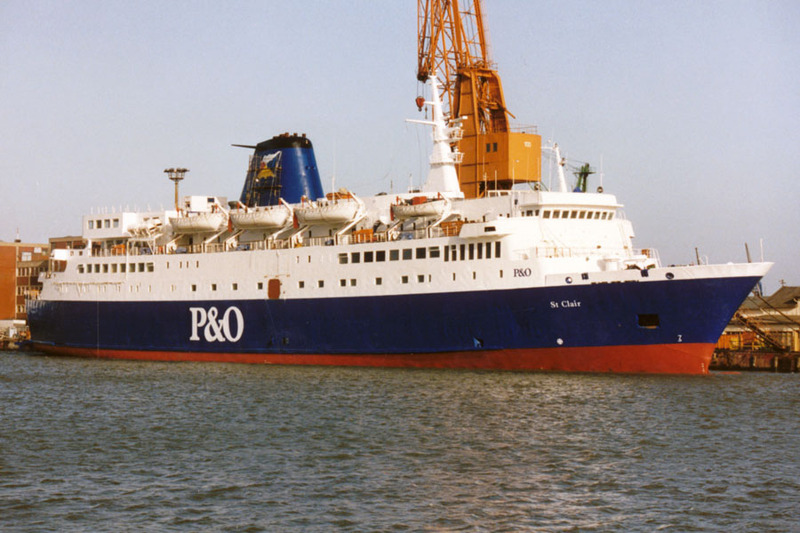 October 1991: Freight only between Portsmouth – Caen. 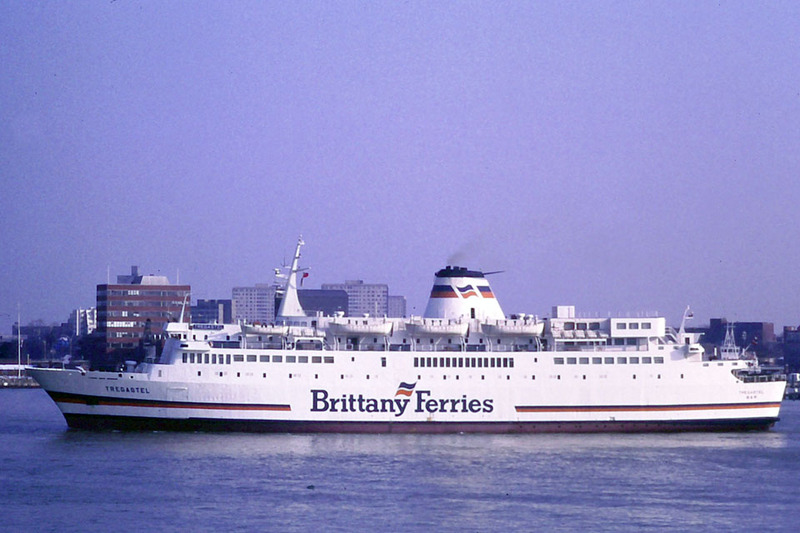 December 1991: Kept in reserve by Brittany Ferries , then laid up at Chatham. 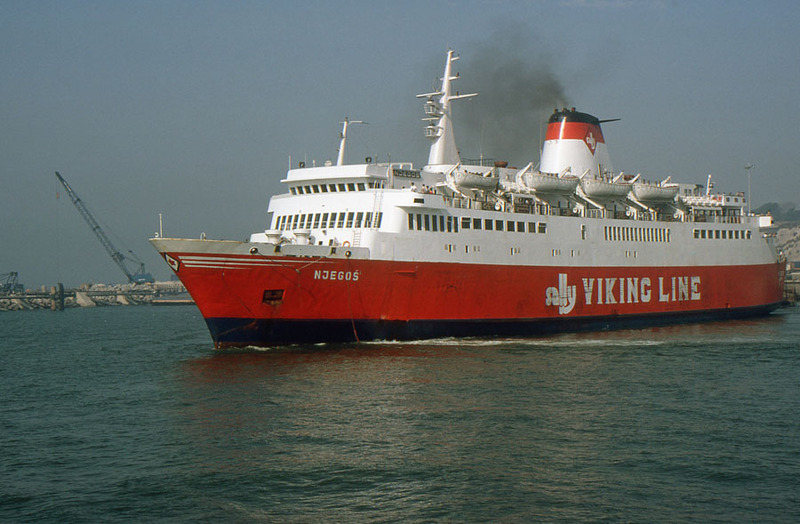 January 3rd 1992: Sold to P&O Steam Nav. Co London. Renamed TREG. 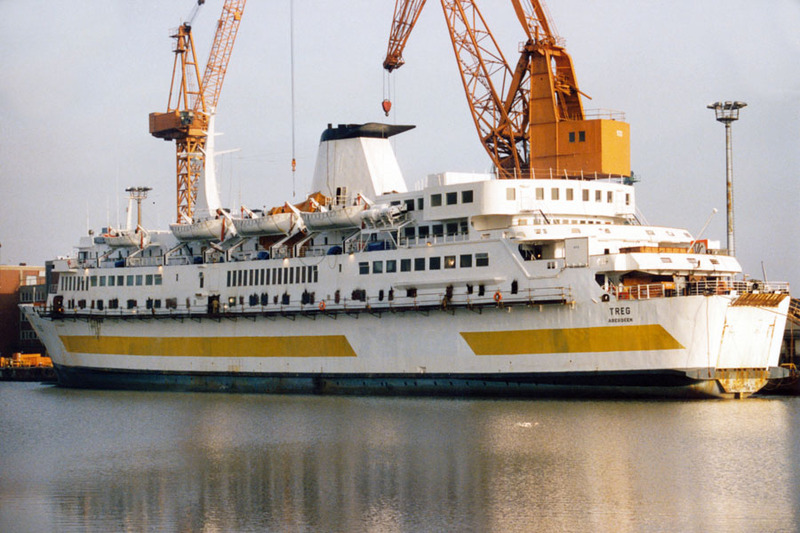 January 4th 1992: Arrived at Lloyd-Werft GmbH, Bremerhaven for rebuilding. 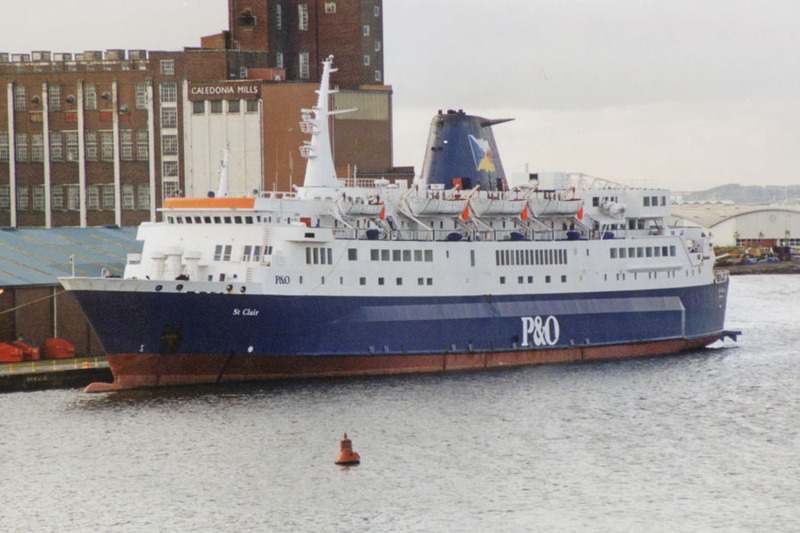 March 6th 1992: To P&O Scottish Ferries, Aberdeen, Scotland and renamed ST CLAIR. 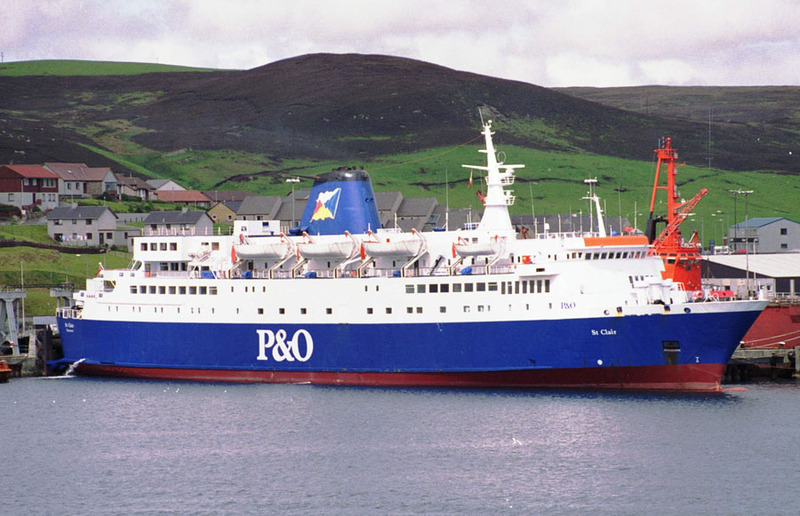 March 11th 1992: Commenced service between Aberdeen – Lerwick and other trips between Lerwick – Bergen. May 14th 1992 – May 18th 1992: Exhibition ship in Stavanger. 1995: Rebuilt at a cost of £1.2 million with side-sponsors adding 100 tons to her weight. 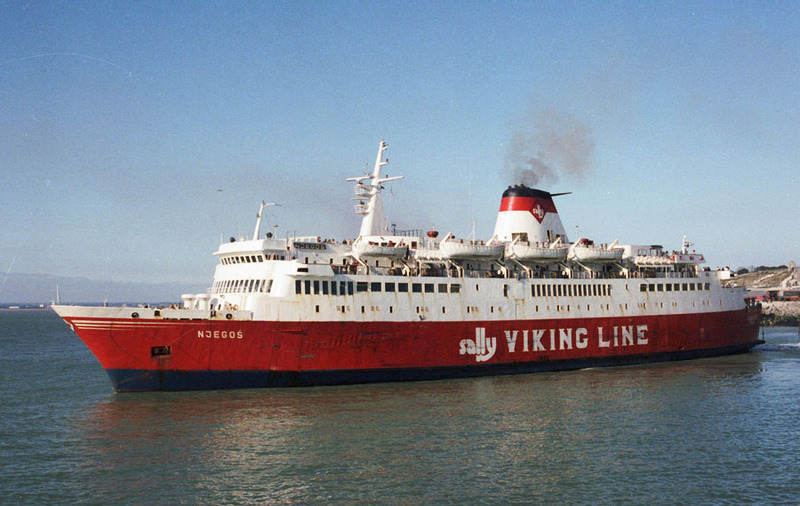 April 1995: Resumed in service. 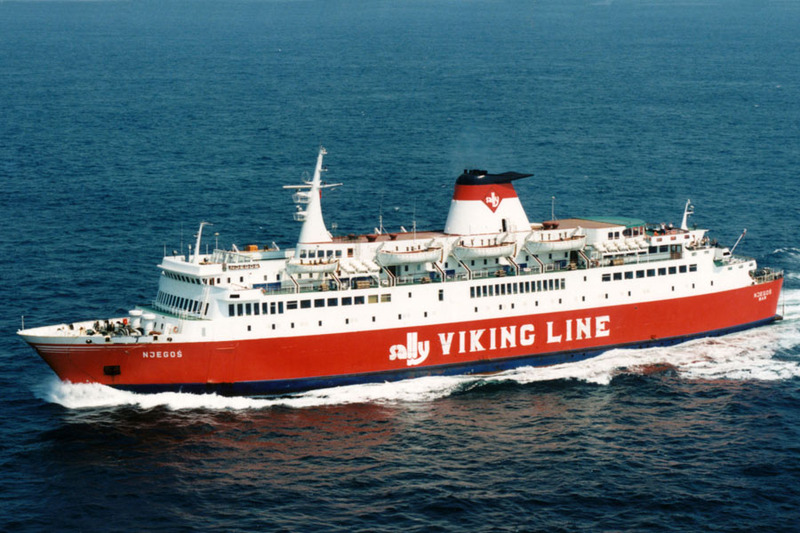 August 24th 1997: Last trip Lerwick – Bergen. 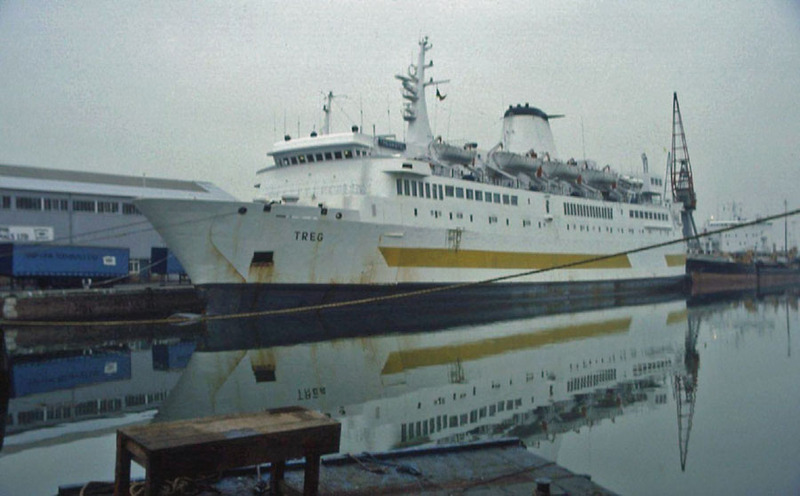 October 1st 2002: Last day in service between Aberdeen – Lerwick then laid up at Leith. October 26th 2002: Arrived at Rotterdam. November 1st 2002: Left Rotterdam for Saudi Arabia. 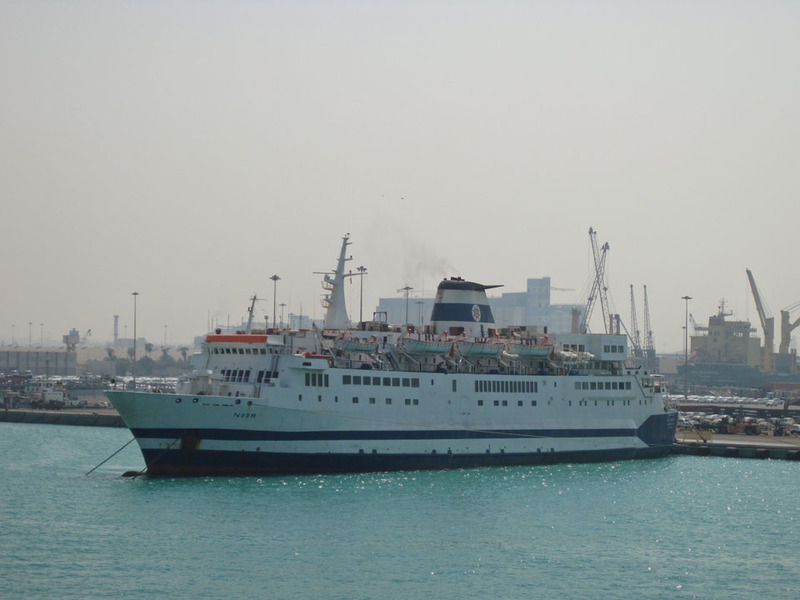 2002: Services in the Red Sea between Jeddah – Suakin. 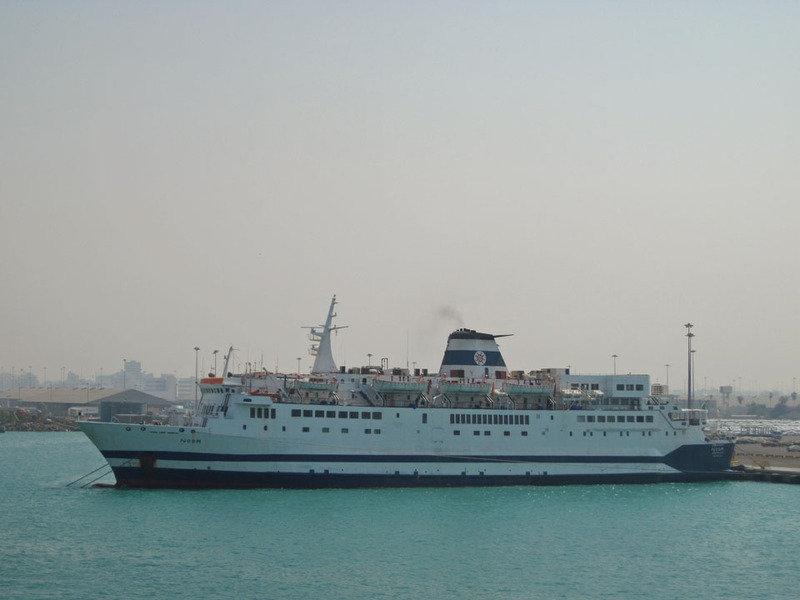 July 2011: Renamed NOOR and last known as being in Jeddah (September 2011). We would like to thank: Tony Garner, Ton Grootenboer, Frank Heine, Dirk Jankowsky, Drago Krivokapic, Willi Langes, Ken Larwood, Simonwp, Jurgen Stein, Ulrich Streich and Andreas Wörteler for their assistance in producing this feature. All information is believed to be correct and no responsibility is accepted for errors and omissions.